Our new Keto Salt contains a balanced blend of sodium, potassium and magnesium – all minerals that people on a low-carb diet need to consume in greater amounts. The pack also includes our Concentrated Ionic Magnesium drops to boost your daily magnesium intake even further. Combine Keto Salt and magnesium drops in a mineral drink to boost your intake of essential macro minerals (see directions below). This pack will allow you to create a restorative mineral drink that will boost your intake of essential minerals, and which you can tailor to your own requirements by varying the amounts of salt and magnesium. To make up the mineral drink mix ½ – 1tsp of minerals (depending on your needs) in 500ml–1L of still or sparkling water and add lemon or lime juice to taste. Then add your preferred dose of Ancient Lakes Concentrated Ionic Magnesium drops. 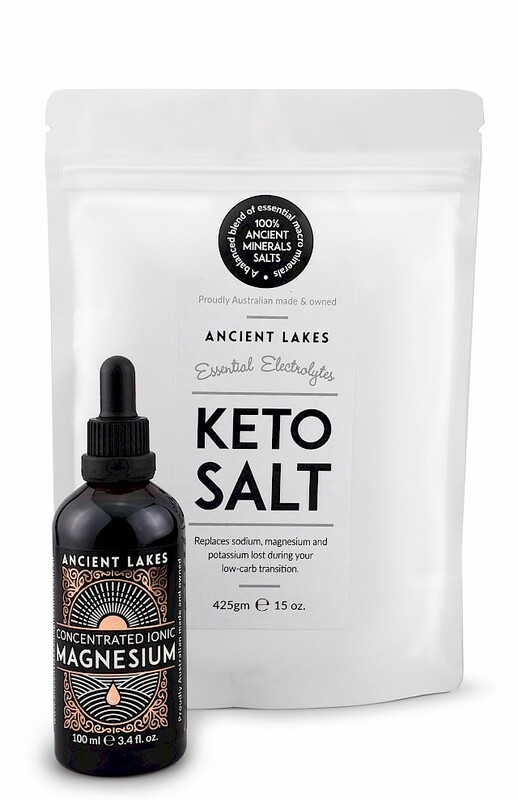 Ancient Lakes Keto Salt is a balanced blend of essential macro minerals to help replace salts lost during exercise, summer heat or for those transitioning to a low carb-or ketogenic diet. Combines ancient magnesium-rich salts from pristine Lake Deborah with our concentrated ionic magnesium and enriched with potassium. 3g (½ tsp) will provide you with 810mg sodium, 210mg potassium and 12mg magnesium. These natural, magnesium-rich ‘bitterns’ contain 98.5mg/ml magnesium ions in solution. They are a complex mix of ionic minerals of magnesium, potassium, calcium, sodium, boron, iodine, zinc and other highly soluble minerals. This highly concentrated source of magnesium and other essential minerals is gently harvested from our ancient salt lake – Lake Deborah in the Western Australian desert.